Join us for our next performances in celebration of Easter at the wonderful Kapuzinerkirche in central Vienna on April 14th at 6pm and April 16th at 6.30pm. On the April 14th, the program will include the wonderful Concerto for 2 Violins in d minor by JS Bach. On the 16th the central work will be the stunning string quintet by A. Glasunov. 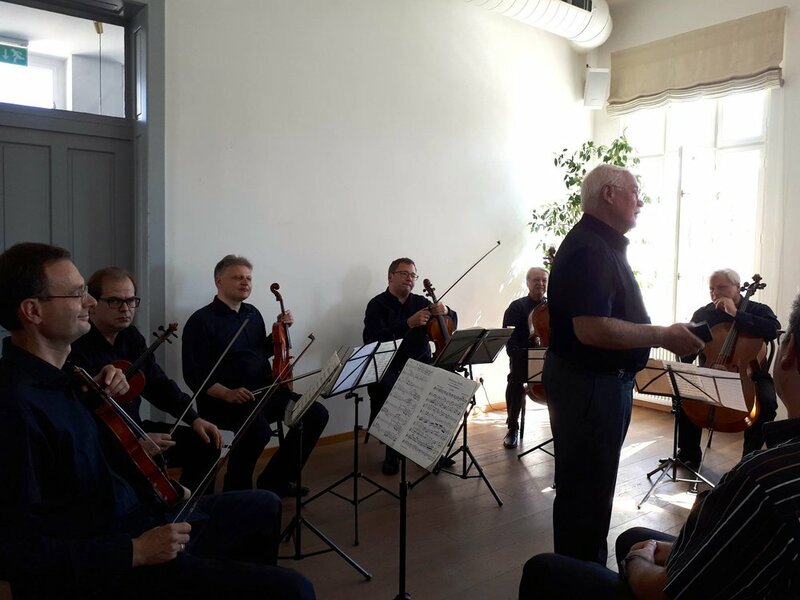 An article from German newspaper about the recent performance of the Melos Ensemble in Germany. Playing the gorgeous Bruch violinconcerto Nr.1 in February 2018. A great short documentary (in German) on the KlangFEST 2017 festival in Bad Ischl. These are pictures from a performance of Schoenberg's epic "Verklärte Nacht" with the Aron string quartet and Valentin Erben, the Cellist of the Alban Berg Quartett. Below are pictures from a concert of Vivaldi's Concerto in e minor that I played on March 12, 2017 near Vienna. The photos are of the rehearsal, relaxing with a new friend before the concert and me in action. A wonderful student from Nagano, Japan, came to Vienna to have an intensive week of lessons. It was a great week of work, and we took her up the Kahlenberg mountain for the most beautiful view of Vienna. 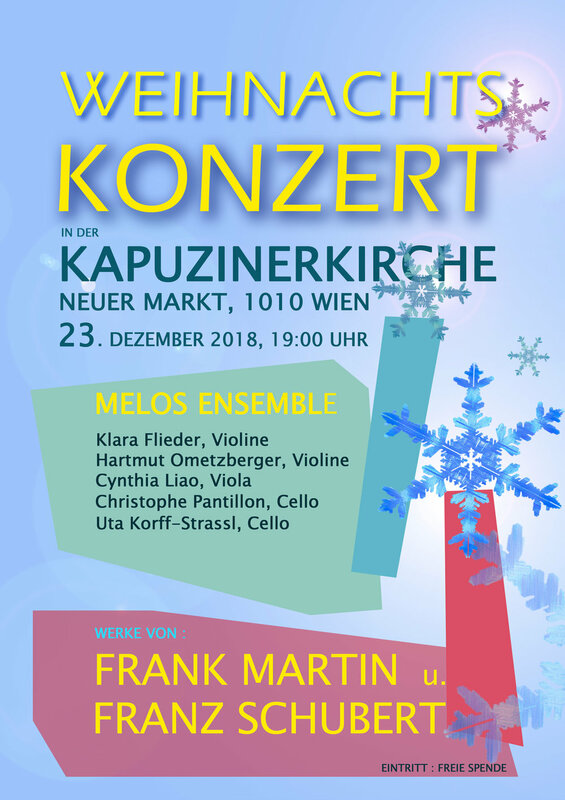 Performing our New Year's concert at the famous Kapuzinerkirche in central Vienna. The monastery is the final resting place of the House of Habsburg. We performed the wonderful "Il Tramonto" for soprano and string quartet by Ottorino Respighi with the fabulous Diana Jacklin singing the soprano solo. I then performed the epic Schubert string quintet together with my terrific colleagues Clara Flieder, Cynthia Liao, Uta Korff-Strassl and Christophe Pantillon. We are going to be performing several times in the coming year as a quintet. Check out the calendar page regularly to find out about the next performance. "The light and shade Hartmut drew out of his ‘fiddle’ was just astonishing and Diva Diana’s performance majestic." "It was a truly world class concert." Performing in the beloved Mozart Saal at the Konzerthaus in Vienna. Standing on the steps of the old Artists' Guild where Rembrandt, Vermeer, Frans Hals and other great Dutch painters stood while in Haarlem to lead a chamber orchestra. Together with the wonderful bow maker Noel Burke at an instrument exhibit in Vienna in January 2016. Of course, we had to try the Austrian wine as well as the bows . . .